… the Smoot-Hawley Tariff Act of 1930 in the US, which drastically raised tariffs on imports, lead to retaliation by trading partners, and the resulting trade war dropped global trade by 66% between 1929 and 1934. One more comment from me: Trump may be on to something with some of his tariff actions, but he risks having the US run headfirst into the brittleness of just-in-time supply lines. Nicole Foss: As the world has become a smaller and smaller place over the last few decades, we think less about the differences between locations. Global trade has allowed us to circumvent many local constraints, evening out surpluses and shortages in a more homogenized world. We have a just-in-time world built on comparative advantage, in the name of economic efficiency. Under this economic principle, every location should specialize in whatever activity it executes most efficiently and the resulting products from all areas would then be traded. The idea is that all will then be better off than they would have been had they attempted to cover all bases themselves for reasons of self-sufficiency. Where countries had been inclined towards more expensive self-sufficiency, market forces have often made this approach untenable, as large cost differences can make countries or industries uncompetitive. Local production has been progressively out-sourced as a result. By ‘better off’, economists mean that goods will be cheaper for all, thanks to global wage arbitrage and economies of scale. Globalization has indeed delivered falling prices for many consumer goods, particularly electronics. In an era of massive credit expansion (effectively inflation), such as we have lived through for decades, one would normally have expected prices to rise, as a lagging indicator of money supply expansion, but prices do not always follow money supply changes where other major complicating factors exist. In recent years, the major complicating factors have been the ability to produce goods in places where wages are exceptionally low, the ability to transport those goods to consumer markets extremely cheaply and ready access to letters of credit. For nominal prices (unadjusted for changes in the money supply) to fall during an inflationary period, real (inflation adjusted) prices must be going through the floor. This has been the effect of trade as we have known it, and it is all many of us have known. What we are not generally aware of is the vulnerability of the global trade system, due to the fragility of the critical factors underpinning it. By producing goods, particularly essential goods, in distant locations, we create long and potentially precarious supply lines. While relative stability reigns, this vulnerability does not cause trouble and we enjoy cheap and plentiful goods. However, if these supply lines are disrupted, critical shortages could result. In a very complex just-in-time system, this may not take very long at all. Such as system is very brittle, as it has almost no redundancy, and therefore almost no resilience. When Jim Kunstler refers to efficiency as “the straightest path to hell”, it is this brittleness he is referring to. The most ephemeral critical factor for trade is the availability of letters of credit. These became scarce during the first phase of the credit crunch in 2008, and the result was goods stuck in port even though there was robust demand for them elsewhere. Goods simply do not move without letters of credit, and these can dry up extremely quickly as a systemic loss of confidence results in a systemic loss of liquidity. In a very real way, confidence IS liquidity. 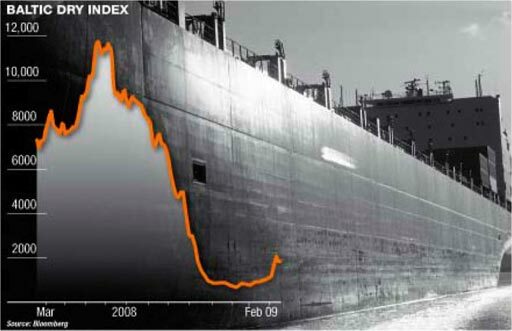 The Baltic Dry shipping index fell 96% in 2008 as a result, meaning that shipping companies were suffering. Although the index has recovered slightly during the recent long rally, it is still very depressed in comparison with its previous heights. 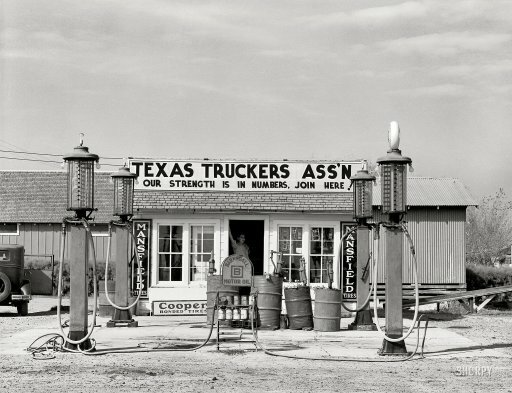 Now that the rally appears to be over, on the balance of probabilities, letters of credit for shipping will come under renewed pressure, and goods will once again have difficulty moving. As demand also starts to fall, due to the loss of purchasing power in the depressionary era we are moving into, this will get far worse. In a depression, trade is very adversely affected. One reason for this a highly protectionist beggar-thy-neighbour economic policies. For instance, the Smoot-Hawley Tariff Act of 1930 in the US, which drastically raised tariffs on imports, lead to retaliation by trading partners, and the resulting trade war dropped global trade by 66% between 1929 and 1934. 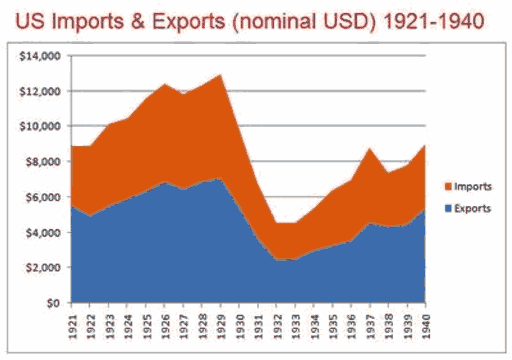 Thanks to globalization, we are much more dependent on trade than people were in the 1930s. The combination of credit drying up on the one hand and global trade wars on the other is an extreme threat to our vulnerable supply lines. Add to that the general upheaval created by severe economic disruption, which can easily lead to increased physical risks to transporting goods, and the longer term potential for much higher energy prices, and we could see an outright collapse of global trade in the approaching years. The benefits of self-sufficiency will be seen in places where it still exists. So long as the whole supply chain is local, localized production means being able to maintain access to essential goods at a time when obtaining them from overseas may be difficult or impossible. It is currently more expensive, but the relative security it can provide can be priceless in a dangerous world. The ability to produce locally does not arise overnight however, especially where there are no stockpiles of components. In places where it has been lost, it will take time to regain. There is no time to lose. We will be returning to a world of much greater diversity as we lose the homogenizing effect of trade. That means the existing disparities between areas will matter far more in the future than they have in the recent past. We will need to think again about the pros and cons of our local regions – what they can provide and what they cannot, and for how many people. Some areas will be in a great deal of trouble when they lose the ability to compensate for deficiencies through trade. As the global village ceases to exist, the world will once again be a very large and variable place.